Ranchers need to recognize that we are still in the bottom section of the beef price cycle. The November, December and January markets have cooperated a little with cattlemen. As I discussed in a previous Market Adviser, 2016 was the year to market calves late in the year, or even into January 2017. Figure 1 presents actual eastern Wyoming-western Nebraska steer calf prices through January 2017, with projections on through fall 2017. The purple numbers are what I use to project grass cattle for each summer. Once again, I am suggesting that fall 2017 weaning prices could be up slightly from fall 2016 — a good sign for cow-calf producers, even if it is only a small increase. Ranchers need to recognize that we are still in the bottom section of the beef price cycle. 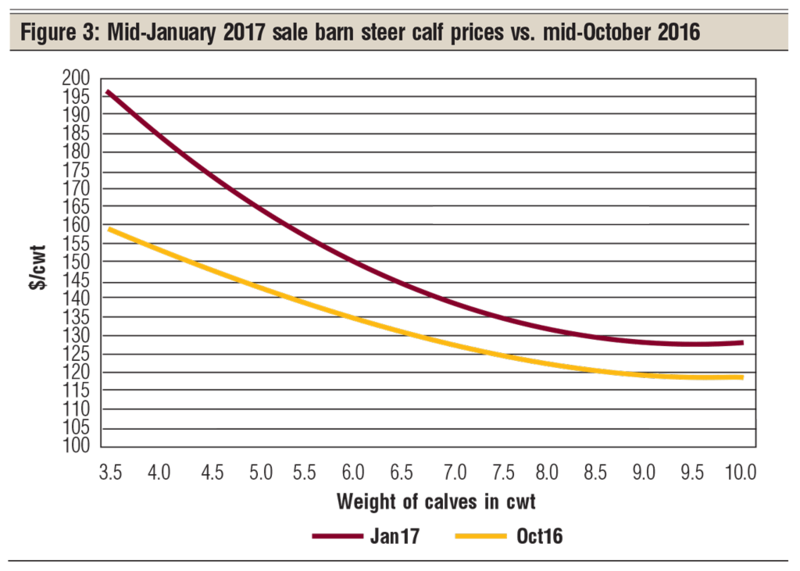 My projections point to a reasonably strong spring market for slaughter cattle, with a drop-off again in summer 2017 — a normal seasonal pattern. My numbers suggest that cattle feeders can now lock in some feeding profits at least into early summer. Figure 2 shows the current (as this is being written) live cattle futures market history for April, May and June contracts. The general rule is that the April market is the highest of the three months. The May market is usually below April, and the June market is usually the lowest of the three months. The exceptions for April, May and June prices — for example, 2008 and 2009 — are usually in the beginning phase in the next price cycle, where prices are increasing. Note 2006 prices. The price cycle started upward. Then ethanol was launched and corn prices went up dramatically, driving the cattle prices cycle down. In 2009, cattle prices started back up again. Selling finished cattle from now until spring of 2017 looks promising. I am showing a profit in cattle harvested in mid-January. I am also showing a profit in finishing 2016 grass cattle that came off grass last September. I am even showing some profit with steers put on feed mid-January 2017 and harvested in July. It appears that these favorable feeding situations are what is driving the current (January 2017) feeder cattle market with the relatively strong heavy feeder steer prices illustrated in Figure 3. These heavy feeders should be ready for harvest in the spring. All of this suggests a supply surge this coming summer. The challenge for ranchers retaining their 2016 calves is to market the finished animals before summer 2017. 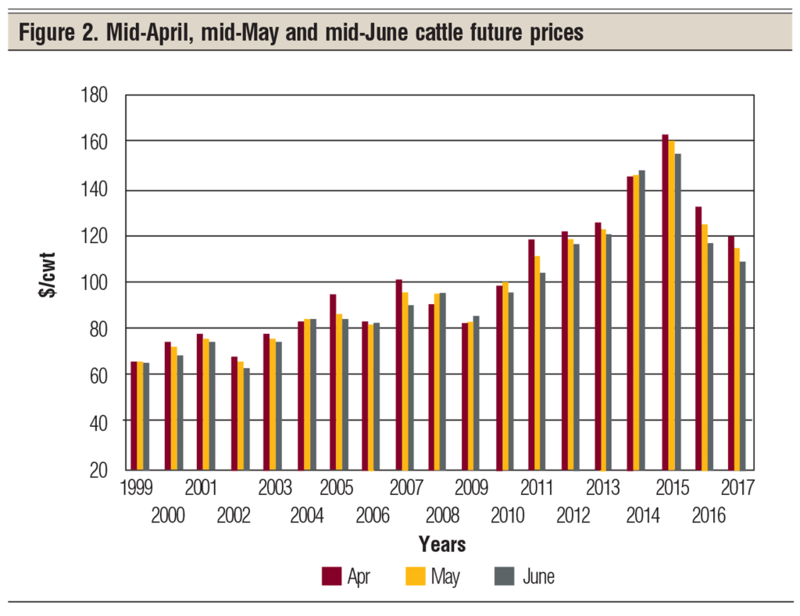 It will be easy to end up marketing finished 2016 calves in June or later with lower summer slaughter cattle prices. I suggested in my last Market Adviser that I would share the marketing program for 2016 calves executed by my study rancher. He decided to background his 2016 calves and either market them as 800-pound feeders or send them to a custom feedlot to finish. Right now, the projections favor selling after backgrounding. That decision will be made toward the end of the study rancher's backgrounding program. My current projections are that backgrounding his calves will cover the 2016 losses calculated for the study beef cow herd. We are now actively working on the 2017 business plan. Our work on the five-year business plan for the bottom of the current beef price cycle is being delayed so we can focus all of our current attention on the 2017 business plan. Due to the poor 2016 business year, cash flow in 2017 is our current big challenge. It looks like 2017 is not going to be a great cash flow year, either. Our goal is to spread the 2016 short cash-flow problem out over 2016, 2017 and 2018, rather than absorbing all of the cash-flow shortage in 2016. We are exploring selling 20 late-calving cows in early 2017 and then holding back more 2017 replacement heifers in fall 2017 and again in fall 2018. The cow herd should start increasing in numbers again in 2019. These added replacement heifers would start calving in 2019 and 2020, in hopes that their lifetime calf production would occur during the increasing price phase of the next beef price cycle. Our projection model of this strategy, selling bred cows and adding replacement heifers, is still under development. Stay tuned. Hughes is a North Dakota State University professor emeritus. He lives in Kuna, Idaho. Reach him at 701-238-9607 or harlan.hughes@outlook.com.